This week, I'd like to mix things up a bit and focus on some developments you should be aware of as an investor and concerned citizens. We will skip the usual charts and technical comments this time in favor of more commentary. As always, in case of questions, please email: info@fxistrategies.com. Enjoy reading! Marketplace had a wonderful segment in College Confessions. Quite entertaining to see where some of Marketplace's own staff came from in terms of understanding personal finance (click on the "Listen" button to hear their personal stories). The underlying theme of all these confessions is the struggle with money, the scarcity of it and the inability to manage personal budgets. And yet, it's also refreshing to see that despite monetary constraints, the college years were some of the most formidable and perhaps some of the happiest years for many of us. I certainly remember the days when money was really tight, no matter what the underlying economic situation was. Everything was new too and it was a "jump in the water and see if you can swim" sort of life, at least in the first year. We had to learn and adapt, tighten our belts and somehow we made it. 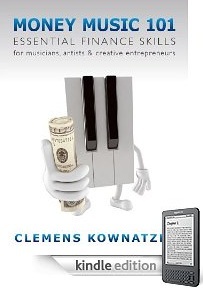 I can't help thinking, wouldn't that be the right approach to deal with the financial crisis? Certainly, some limited financial life-lines needed to be handed out in order to prevent a systemic collapse. But what has transpired since last year is more like an ongoing hand-out policy. The hand-outs seem to keep coming and there's no sense of a learning experience in terms of dealing with the consequences of corporate (in)actions and inabilities to manage their finances. As the article suggests, some banks are now offering signing packages bigger than those handed out at the height of the bull market. Morgan Stanley Smith Barney offers 160% of the previous year's production, and Merrill Lynch is offering 140% of the previous year's production as basic signing packages. Are we missing something here or didn't Merrill Lynch just barely escape death recently? What happened to "outrage over compensation at Wall Street firms?" Where is our collective anger when many of these institutions received bail out money that they can now shove right back into the hands of the greed driven sales culture at Wall Street? One should be aware that these "Financial Advisors" have little in common with objective independent advice completely free of conflicts of interest. Despite all the confusing disclaimers and regulatory hoopla, rest assured that they are salesmen, "producers" as they are internally called, and the only reason they are in business is to generate profits for the banks first and foremost. Also, do not forget it is the client who ultimately pays for those bonuses in fees. While I am generally in favor of free market solutions with regard to business, the economy and compensation, the fact that banks received taxpayer funds in the billions should give the general public some say in terms of compensation. We can certainly not condone a sales and greed driven culture on Wall Street when the same attitude played a big part in leading to one of the biggest financial crises in history. After 2008, no one should be as naive to think that a free market ever existed in the first place, nor that it will anytime soon. Since we are currently living in an economic purgatory, one should think that more public outrage would require banks to truly change, but apparently it doesn't. Checked the updates on your credit card statement lately. Higher fees wherever you look. Is everyone too complacent to turn their backs to these banks? On a similar note, it doesn't bode well when, amidst the biggest credit crisis, Blackstone’s Stephen Schwarzman Tops Best-Paid Chiefs with $702 million in compensation during 2008. Granted, Blackstone (a private equity firm that went public in 2007) was not on the list of tarp recipients or other bailout money (as far as I am aware of). But it is a financial institution nevertheless and raises concerns over compensation methods when the stock performance is in stark contrast to a huge compensation package. On June 21, 2007, Blackstone's Initial Public Offering price was $31. Two years later, the company's stock meandered to about $14, less than half of it's IPO price. The chart below shows the relative performance of Blackstone versus the S&P 500. Yet another example of how illusive returns of individual stocks versus a benchmark index can be. Blackstone faired about 10% worse than the US benchmark index. Where have all the Regulators been? Last week, we discussed a basic overview of the financial regulatory structures of the US, UK and Europe (Market Insights - 8 August 2009). The U.S. Securities Exchange Commission and recently appointed SEC Chair(wo)man Mary Schapiro made a few headlines, giving us a glimpse of how poor regulatory oversight must have been and that a new, much stiffer wind was going to blow from Washington in the direction of Wall Street. Robert Khuzami, the new Director of the SEC’s Division of Enforcement, recently gave a speech outlining the new policies and improvements to be made by the SEC. While undertaking a "rigorous self-assessment" he presented a range of new processes and initiatives as a catalyst for the tougher and more efficient enforcement of SEC rules. These initiatives all sound good (on paper) but I cannot help thinking, for an organization that has been around since 1933, this agency was and still is in need of some serious overhaul. Some of the initiatives of this overhaul imply that essential components of any remotely efficient organization were not in place. a) Specialization: It is shocking to consider that the SEC would not have enough or any specialists who understand the complexities of financial markets and financial products. Did we not have enough financial calamities just in the last two decades to warrant some massive efforts in that regard? b) Resources: Currently, the SEC has 1,100 enforcement staff and they have had an approximately 11% reduction in force since 2005. The SEC budget for 2009 was just $960 million when it is expected to collect $1.3 billion in fees for 2009. A budget of $960M for an organization of the status and importance of the SEC is only about 37% higher than the compensation of Stephen Schwarzman (see above). Putting that budget into perspective, I doubt very much that SEC employees are highly paid. But let's just say that on average each staff in the enforcement division makes $100,000 per year. That leaves another $850M going to exactly what - Admin? "We will also be hiring, for the first time in the Division’s history, a Chief Operating Officer who can manage information technology, oversee project management and build efficient workflow processes, including in the critical area of our collection of funds and the distribution of those funds to harmed investors. Many of these tasks are currently being handled by lawyers in the Division, and it is better for all involved if such tasks are handled by persons with the proper background and training." I was speechless when I read this - and still am sort of in shock... So it took "rigorous self-assessment" to figure out they needed a COO who can manage IT in this day and age? Instead "many of these tasks were handled by lawyers?" In my experience with financial regulators, both in Europe and the US, there are some fundamental issues that need to change. For starters, regulators have to understand how companies operate, not in theory but in practice. This means that regulators should spend a lot more time on the trading floors and in dealing rooms of the banks rather than pouring over print outs of financial statements who rarely reflect the true nature of the mechanics and risks involved. Real life example: Trading desk A is assigned to one firm within a group of companies, desk B assigned to another firm within the same group but technically and legally operating outside of the regulatory environment. Because desk B does not fall within the regulators realm it goes un-inspected. The fact that business was separated between 2 different desks is good enough reason for regulators to simply not know about those activities of desk B even when Desk B is within the same office and essentially run by the same company. Effective regulation cannot work that way; point in case: Mr. Madoff. To improve the efficiency of financial regulation, another fundamental change has to take place. Instead of recruiting accountants and lawyers, both of whom are often clueless about the financial instruments they’re supposed to oversee (they only need to understand trading and risk from reading a book), regulators should find ways to attract real talent, real brokers, traders and market practitioners who can feel and smell when something isn’t kosher. Both stories depict some good and important developments, portraying a sense that the SEC is getting tougher in enforcing regulatory requirements. Yet, it would be equally important to have an enforcement philosophy driven by smart and wise board members who can determine the right tone and set priorities with regard to relevance towards market safety, market integrity and of course investor protection. For instance, when cases against financial institutions such as the hedge fund Perry Corp take place, we need a policy towards swift and rigorous regulatory action. The Perry investigation had lingered for years. Perry agreed to pay $150,000 to settle without admitting or denying wrongdoing. Unbelievable from a business management perspective... An investigation that lasted several years yields $150,000 in fines? Do the math: $150,000 @ $500 per hour (average attorney fee) gives you 300 hours, about 1.5 month's worth of fees for one attorney. It may be an oversimplification but to a certain extent, all those staff and attorney costs could have been better utilized to detect and prevent many of the recent Ponzi schemes and other financial disasters. Instead of paying lip service to some less important matters, the qualities of a regulator who operates with skill, care and diligence must yield better results. "The levered ones cause me some concern. [It is] certainly possible for them to be mis-sold . . We're going to . . look at the entire ETF realm very carefully this fall." Why wait until fall? Leveraged ETFs should definitely cause some major concerns among regulators simply because they increase the leverage of the individual investor. If I can figure this out with very limited resources, why does it take the professional investigators at the SEC so long to put some tighter regulation in place? Normal margin requirements to purchase stocks are 50%. Leveraged ETFs can increase that leverage considerably (some double and triple leveraged ones are out there). And with increased leverage comes increased risk. In addition, the sometimes obscure fees and misleading performance expectations of leveraged ETFs versus the underlying asset or index would lead a sensible regulator to impose certain minimum requirements for investors before they are allowed access to these ETFs: Either have enough net worth to bear potential financial losses from the increased risk, or have the understanding and experience to invest in these instruments. To give you an example, selling uncovered put options (a.k.a. naked put options) is only available to an investor who has the financial net worth and/or knowledge to deal with the risks that come with such a trading strategy. However, what most investors don't realize and what is often mistreated in terms of presenting risk: Selling naked put options is less risky than buying stocks outright; any professional trader can attest to that (if you like a detailed explanation please email me). Yet, it is considered one of the riskiest trading strategies and typically not available to average investors. And yet, some of these recent ETFs have a much higher degree of risk but they can be bought and sold just like any other share. My sense is that someone who doesn't understand the complexities of a financial transaction should simply stay away from it. At the same time, implicit misrepresentation of certain ETFs and other financial products can cause considerable damage to investor confidence and investment returns. It would appear that financial regulators were often in the same boat as individual investors in that they did not completely understand the instruments they were supposed to regulate. When they don't understand complex financial instruments, they should simply not allow them to be sold to the general public and for the rest of the institutions and financial heavy hitters it's: Buyer beware! 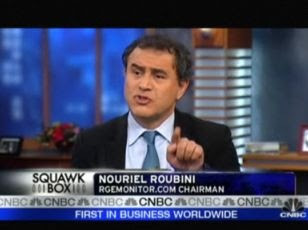 Please click here to watch Nouriel Roubini's interview at CNBC. Yet more from Nouriel Roubini. Please consider: Are There Bright Spots Amid the Global Recession? "All economies have been affected by the crisis, but a combination of policy responses and strong fundamentals has given some countries, especially some emerging market economies, a relative edge. These same strengths could lead the countries we highlight below to perform better as the global recovery begins, even if their growth rates remain well below 2003-2007 trends." "their ability to return to sustained growth will depend on structural reforms that support consumption"
This is an essential pre-condition. Creating a functioning middle class that can increase consumption domestically is not going to take place overnight, not even in China and India; it may take a whole generation. If emerging markets are to return to substantial growth, I would argue that global growth is highly dependent on a recovery in the developed countries since they, for the foreseeable future, have the depth and the size of a middle class that can increase consumption substantially. Therefore, I feel that the figurative cat is going to bite its own tail for quite some time. If you have a strong view on any specific country that might have a distinct edge in terms of growth prospects, there are ways to do country-specific investments either via currency directly or, as you would have guessed, via ETFs. Again, those are not for the light hearted and should be carefully considered including understanding the risks and expense ratios. For a list of country specific ETFs, please email us. Of course, we couldn't go completely without graphs. Here's the chart of the week with an interesting perspective on comparing various bear market trends. When adjusted for inflation, the all-time high for the S&P 500 was in 2000, not 2007 and consequentially we are now near the end of the first decade of a long-term bear market. Incidentally, that is also about half the way of the other two major bear markets, the Great Depression and the Nikkei which is about two decades and counting. Thanks to Dshort.com for this very interesting chart!